Mozart all turca pdfs - not the fast section, the actual alla turca movement, but the slow first movement of this sonata for beginners. An easy and lovely introduction to this famous piano music! 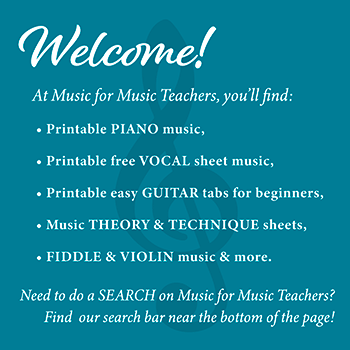 Please scroll down the page for the links to the free printable sheet music. The original piece is written in the key of A; here, I have placed it in C, where it fits very nicely for young beginning readers. You many notice that instead of three beats a measure, I've made this six beats, so that quarter notes can replace the eighth notes found in the original piano version. A nice feature of this melody is that it only uses five notes, all fitting well into the hand! The benefit of this little arrangement is that students can focus on just one note at a time - but because it is in the key of A, you can grab your own Mozart sonata book and "accompany" them with the real first movement of the Sonata in A. The long whole notes and half notes are just right for counting rhythm, for young students. As for the dotted half notes (lasting six beats), they are an excellent opportunity to discuss how a dot adds value to the note it is next to - always, dots are worth HALF of whatever they are beside.